During his keynote at EDUtech, Sir Ken Robinson stated ‘We are all marinated in our own world views’. This has stuck with me and something that I have been contemplating recently in regard to nurturing a Maker culture in my classroom. For me maker culture is a way of looking at the world with a construction lens. I liken it to holding a magnifying glass up to things and seeing them as intersecting parts that I could mix up, hack apart and try to put back together in a variety of ways. A way of seeing the world as malleable and not fixed. I suppose this type of lens to the world also fits Dweck’s ‘Growth mindset‘ as it is a focus on tinkering and trying rather than avoiding a possible fail moment. Tinker till it works or, at times, tinker until it is something marvellous that you hadn’t planned for but fits the need. When I see something about to be discarded I can’t help but think ‘oh, that could be useful’. But when asked how I’m going to use it I can never really give an answer that seems to satisfy, which then gives way to that ‘oh you BT’ smile. Mainly because it’s not me who could be using it and how will I know what the students come up with – but in having it in the classroom could give a student the opportunity to use it to explain an idea or explore a possibility. I’ve come to realise that my classroom is becoming a construction kit. And it’s the mash ups of the materials that can lead to the most exciting outcomes for students. 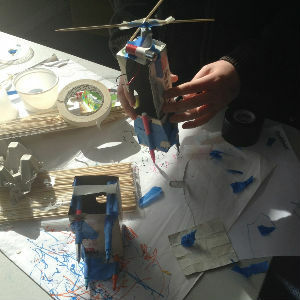 The combination of technology and familiar materials that can support students to explore ideas and catalyse discovery. 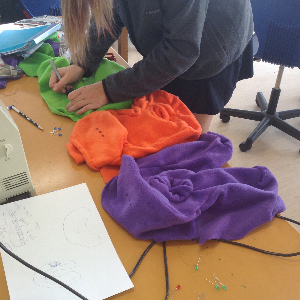 The maker mindset is about action, acting on the world around us, and by giving students a variety of tools and materials to use which have a non-defined purpose gives way to ‘I suppose…’ ideas. To play with using a construction lens. 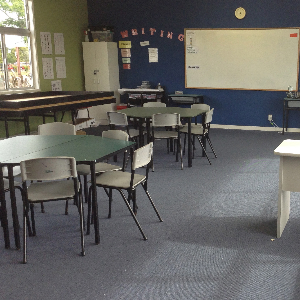 The idea of a ‘makerspace’ as a defined and special location within a school where students are given the opportunity to experiment in these ways just doesn’t quite compute to me. I tweeted a few months ago with a #dontneedamakerspacetomake hashtag to get my point across. One of my classes is run off a simple upcycled trolley (top left in the middle photo) and we take over the location given. 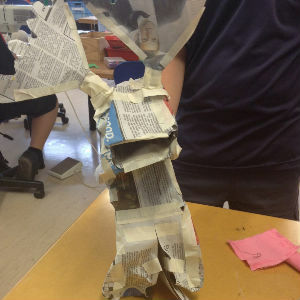 I know of other teachers that are having great success using maker tools in in both Primary and High School classrooms – with no Makerspace or Fab Lab label in sight. 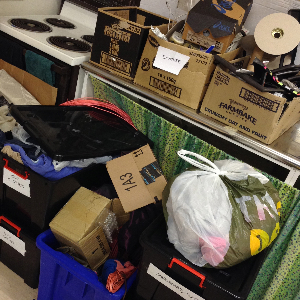 The students are used to piling their bags in a corner then spending the first 5 minutes of the lesson reconfiguring the classroom to whatever we are up to for the next block. We utilise old office desks as soldering stations, a new entrant table which we decided made for the best kneeling station for giving feedback and spend a lot of time just sitting on the floor. 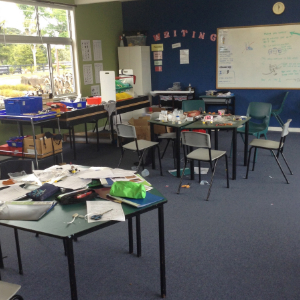 The messiness of making is massive by the end of the day and scattered around the class but the discovery, inventiveness, and problem solving is well worth it. 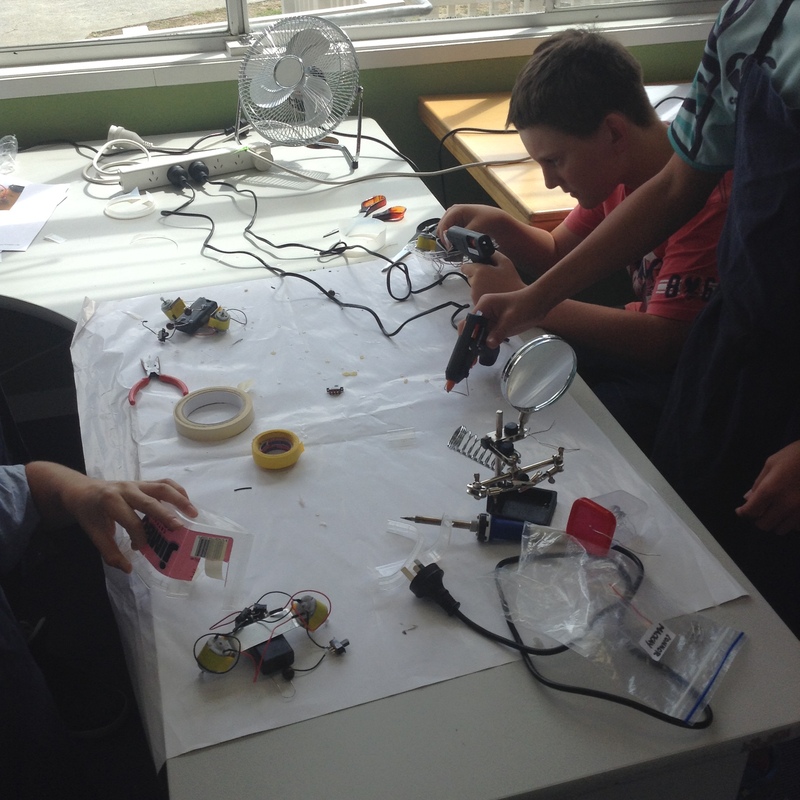 So I suppose my world view is ‘marinated’ in makerness which lends itself to a culture of tinkering within my class. For some students this is very unfamiliar territory, helplessness levels rise as they ask for answers or request step by step directions to an outcome. My challenge now is to uncover how I can hold a space for students to feel comfortable to tinker with their lens and play with the construction kit available to discover new possibilities.